Institute manager Kevin Deery is happy his side got only their third clean-sheet of the season against Annagh United, on Saturday. Even at this early stage of the campaign, Deery is already talking about goal difference. 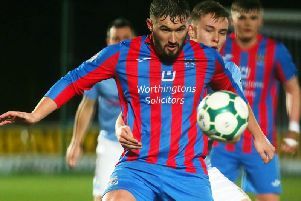 “We now have got plus eight goals in our last two games, we managed to get three back at Armagh and now five against Annagh, so ideally that’s what you want,” he said. “Those six we lost up in Larne we have got them back and added two more, so that’s pleasing. “Look last season we got into the play-off spot with one goal and you can’t underestimate goal difference and that’s all I said to them at half-time.